Halloween is an exciting time, isn't it? The kids (and grown ups too) get to pick out their favorite costumes and walk door to door for free candy!? It's truly a child's dream! But when you have a child with food allergies, trick or treating is not all fun and games. To be honest, until a few years ago, this isn't something I gave much thought to, even though I myself was allergic to nearly everything as a child as well. Still, I don't recall for me personally that trick or treat candy ever posed much of an issue. But for many, that's not the case..how disappointing for a child to get all geared up for a great night only to be greeted with a bowl full of candy they can't touch. As a mom, I know that this can hard for us to deal with as well. So personally, I have made the decision to take more consideration to make the holiday great for EVERY child. I had a chat with my friend Ashley whose son has severe allergies (including peanuts) to help me come up with a few ways to do so. If you'd like to join me, here are a few tips for an Allergy-Friendly Halloween. There are many candies available that are safe for most including things like Dum Dums, Skittles, Starburst, Twizzlers and Smarties. You can see a longer list provided by Ashley at the end of this post. Of course these are not ALL of the candies available, but certainly a great place to start. Be certain to read labels and watch out for anything that is packaged in the same plant with peanuts. The list at the bottom is milk, egg, peanut, and tree nut free. If you just can't resist buying those Reese's (I can't blame you, they're addicting! ), consider using two separate candy bowls. In one, put all your allergy friendly candies and in the other those contaning peanuts. First of all, it makes it much easier for those with allergies to get what they need, BUT remember for those with EXTREME allergies, even the slightest bit of peanut dust on the packaging from the plant can lead to an allergic reaction...no fun for anyone!! Who says you HAVE to give candy for trick or treat? Instead consider inexpensive party favor toys like spider rings, erasers, etc. You can have these in a separate bowl for those that need them, or give them to ALL your trick or treaters. Parents will be thankful for something less sugary too! Before tossing a handful of random candies into each child's bag, consider allowing them to choose a piece or two they prefer instead. Not only is the candy less likely to end up uneaten this way for ANY child, but it allows those who might have allergies to have the chance to choose something they can eat! Another fantastic tip Ashley shared with me is one for those of you who have a child with food allergies. After trick or treating, she goes through her children's candy and sorts out what they can and cannot eat. They leave the 'bad' foods out and the next morning wake to find that 'The Great Pumpkin' has replaced them with candies they can eat. Now, this may be geared towards food allergies, but I happen to think this is a GREAT idea for anyone who tries to avoid sugary treats. Kids still get the experience of trick or treating, while allowing mom and dad to monitor their food choices better! Do you have children with allergies? 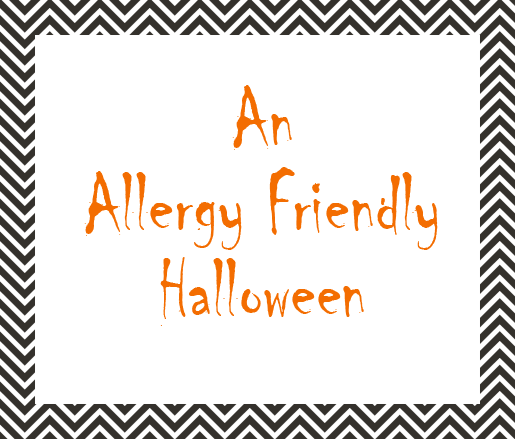 What tips do YOU have to make Halloween a little more allergy friendly? These are great tips. I always fear giving out certain candy thinking a child with an allergy will eat it before the parent checks.